Book this 9-day motorbiking adventure in Ladakh and ride over national highways and mountainous roads in the cold, desert kingdom. You'll visit the multi-coloured lake of Pangong, travel to the sand dunes of Hunder and Sumur, ride through high-altitude passes of Khardung-La and Chang-La, visit the historic monasteries of Thiksey and Diskit, apart from a range of other exciting adventures. Your adventure begins from Leh, the largest city in Ladakh. After exploring the city, you'll take a few days to explore the sand dunes of the Nubra Valley, spend a night by the famous Pangong Lake and travel down to the lush, green valleys of Manali, ending the tour with unforgettable experiences. Arrive in Leh and convene at a pre-determined meeting point. In the afternoon, you'll meet your fellow motorbikers and your road captain for a brief orientation session to discuss the climate conditions, itinerary and other details of your upcoming motorbiking adventure. Overnight in a hotel at Leh. Begin your Ladakh motorbiking trip by taking on the challenge of motorbiking over the world's highest mountain pass, the Khardung-La, at an altitude of over 17,000 feet on today's journey to Hunder. Located in the Nubra Valley, Hunder is famous for sprawling sand dunes and the Bactrian double-humped camels. Enjoy a scenic evening at Hunder or visit the nearby Diskit Monastery. Overnight in Swiss tents or a hotel at Hunder. If you wake up early, before dawn, you can take a short ride from Sumur and visit the hot springs of Panamik. Otherwise, you'll proceed to the Pangong Lake, travelling over an off-beat, rocky and rough route that will test your skills of motorbiking. You'll ride besides the Shyok River, taking in scenic views of the craggy mountains. At Pangong Lake, you can spend some time by the lake and enjoy the star-studded night sky. Overnight in Swiss tents at Pangong Lake. 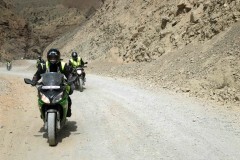 Your motorbiking expedition continues as you travel south from Leh and reach Tso Moriri. The high-altitude Tso Moriri lake appears vast and endless, captivating travellers with views of rolling mountain ranges on all sides. Take some time to dip your feet in the water and meditate in peace. Overnight in Swiss tents at Tso Moriri. Travelling away from the barren hills of Ladakh, you'll return to the lush, green valleys of Manali. You'll ride through the Rohtang Pass, a famous mountain pass in Himachal Pradesh, and drive alongside the flowing Beas River. Soon, you'll find yourself in the charming woods near Manali, featuring thick forests of oak and pine. 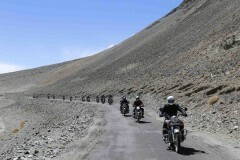 You'll arrive in Manali by late afternoon and return your allotted motorbikes. Your trip ends here. Arrive in Leh. You'll be accommodated in a hotel at Leh. Today's meal package includes dinner only. 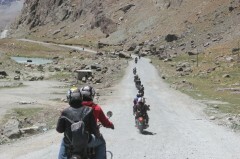 Ride from Sarchu to Manali. Today's meal package includes breakfast only. Your trip ends here. Leh is easily accessible by road or air, from most domestic and international hubs. You can board a connecting flight via Delhi to the city's Rimpochee Airport from most major cities in India.